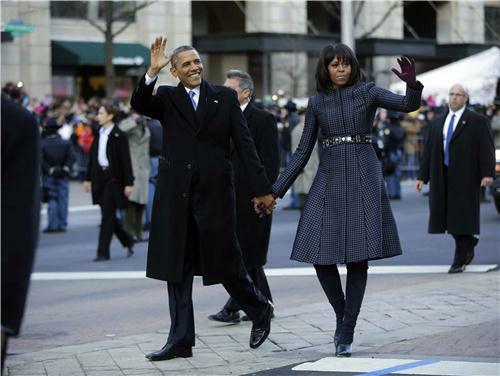 The Associated Press is providing real-time coverage as Barack Obama in sworn in for a second term as president of the United States. 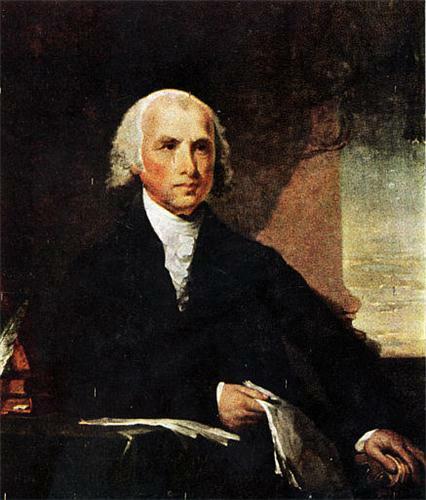 President Barack Obama will channel James Madison and speak about the centrality of compromise, his staff says. "He is going to say that our political system does not require us to resolve all of our differences or settle all of our disputes," says his adviser, David Plouffe, "but it is absolutely imperative that our leaders try and seek common ground when it can and should exist. That's going to be a very important part of the speech." 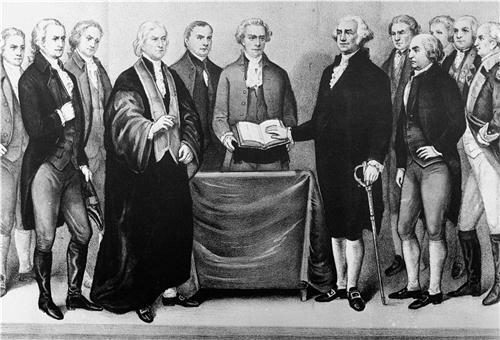 That is the essence of the system Madison and his colleagues designed and enshrined in the Constitution, a complicated scheme of government that Americans have found frustrating at various times in the nation's history. It is a comment on our age that a re-elected president needs to use a healthy dose of his widely watched speech to make the case for it all over again. 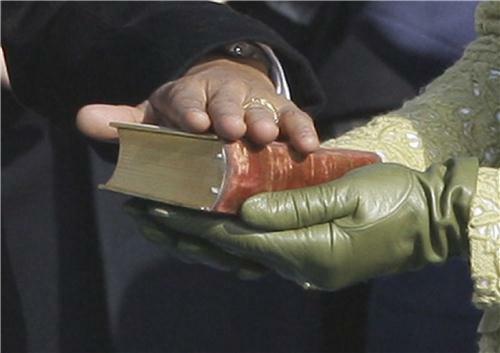 President Barack Obama rests his hand on President Lincoln's Inaugural Bible while taking the oath during his first inauguration. and one by Martin Luther King Jr.
Their selection is especially symbolic because Obama's second inauguration comes on the federal holiday marking King's birthday and in a milestone anniversary year involving both men. 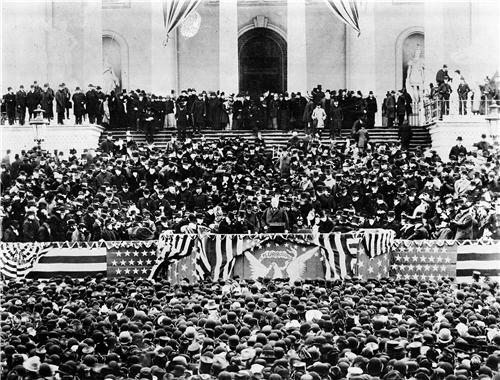 It was 150 years ago when Lincoln signed the Emancipation Proclamation to end slavery, and 50 years ago when King delivered his "I Had a Dream" speech from the steps of the Lincoln Memorial - a monument that will be straight ahead in Obama's sight as he speaks to his country. ﻿Electoral results from the 2012 presidential election. 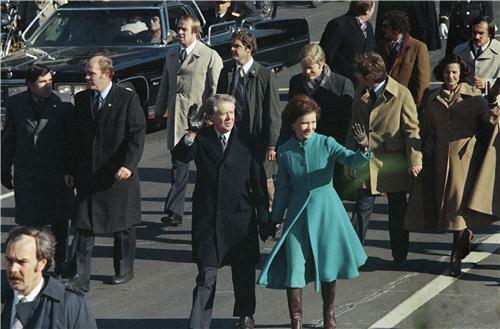 Who's absent from the inaugural ceremonies? Secretary of Veterans Affairs Eric Shinseki will not attend the ceremonies at the Capitol for security reasons. He would be the successor to head the government should catastrophe strike at the Capitol. 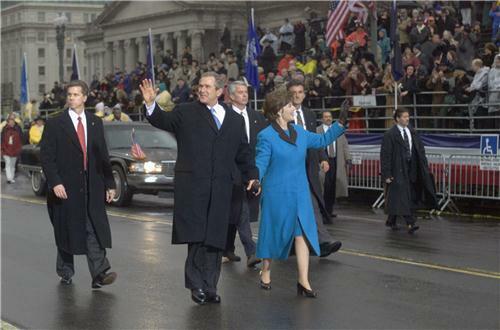 The absence of a Cabinet secretary maintained a long-standing tradition that one member not attend the inaugural ceremonies. 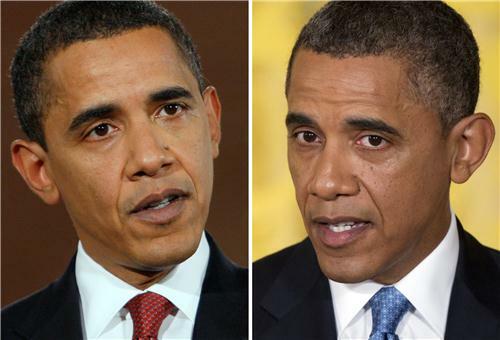 inaugurated for his second term _ or, at least, "inaugurated," since the official ceremony was conducted Sunday indoors. Today's ceremony is the public version. Chief Justice John Roberts got it right this time -- but President Barack Obama appeared to stumble over the word "states" during his ceremonial swearing in. 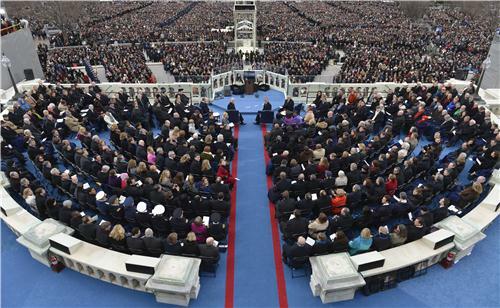 In front of hundreds of thousands gathered to watch, Obama stammered briefly over "states" as he repeated back the words "the office of president of the United States." 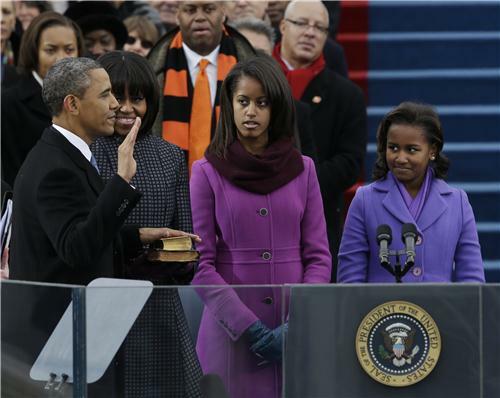 Obama had already been officially sworn in for a second term on Sunday, in accordance with the Constitution, which requires presidential terms to begin on Jan. 20. 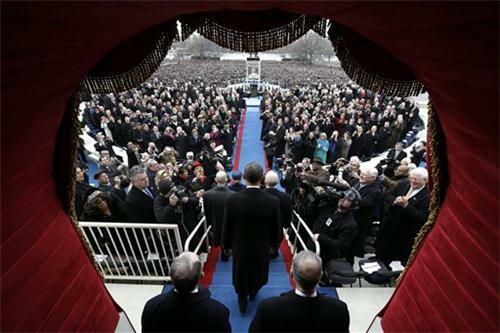 In 2009, it was Roberts who famously flubbed Obama's official swearing in. 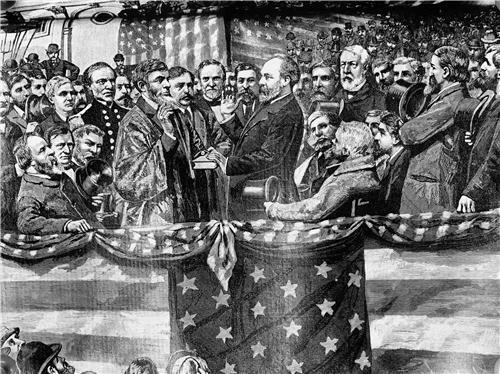 As a result of that mistake, Roberts and Obama repeated the presidential oath in a private ceremony to ensure there were no constitutional issues. 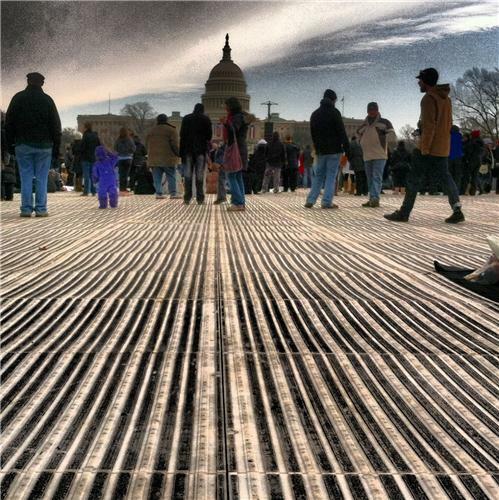 Small streams of people began leaving the National Mall right after President Barack Obama took the oath of office, not staying to hear his inaugural speech. Some were making a quick exit to find a good spot along the parade route, while others wanted to get on Metrorail before the trains got too crowded. "You make me feel bad," said Twanda Rhodes of Longwood, Fla., when asked why she was leaving. "But it's cold, and we have to catch a train." It was altogether a more intimate affair than four years ago. 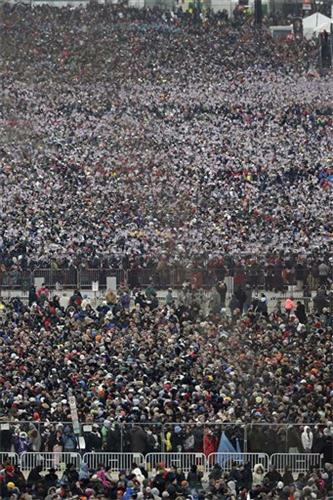 Just a party of untold hundred thousands, chilling in the nation's backyard. 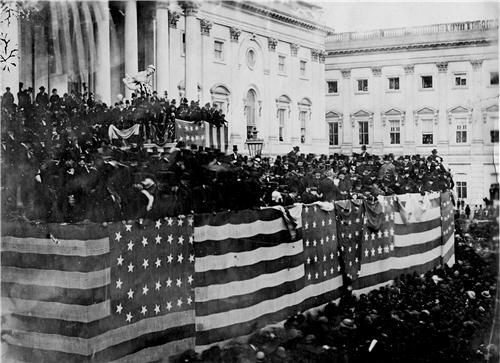 No match for the staggering masses and adrenaline-pumping energy of his first turn as president on the West Front of the Capitol. But a lively second act. Sharon Davis of Suitland, Md., retired after 22 years in the Air Force, said it all made her proud beyond words. "There's a lot of energy here today," she said. "But it doesn't compare to last time, when it was just off the charts." 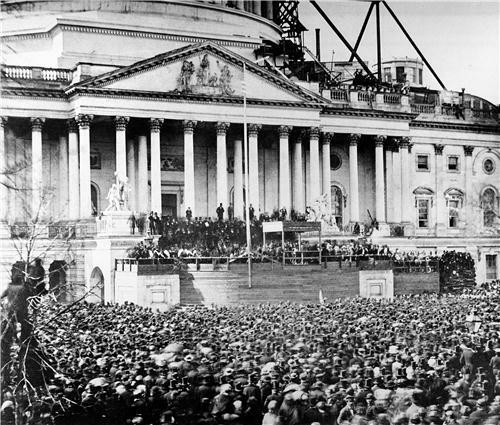 President Barack Obama's second inaugural address was so broad that in 2,114 words, he repeated only three words more than a dozen times and those words themselves weren't exactly telling but geared toward future collective action. • make – 7 times. Obama was slightly less verbose than four years ago when his speech had 2,385 words, but he emphasized the same words in both addresses. He said "us" 23 times, "will" 17 times, "nation" 12 times, "new" 11 times and "America" nine times. – Beniam Fantu, 34, of Dallas. "There are no coincidences. I don't believe there are. This was exactly what was intended, to show how far we have come in our civil freedoms and in our civil rights." – Alenda Young, 39, of Chicago, on the inauguration ceremony occurring on Martin Luther King Jr. Day. Young is president of the Monarch Awards Foundation, the philanthropic arm of Alpha Kappa Alpha Sorority Xi NU Omega chapter. "I think he's a great man. He's trying his best. He did a lot his last period as I think he's going to do a lot more in his next four years." – Karen Espinoza, 24, was working at a Hispanic market in Little Rock, Ark., as Obama addressed the nation Monday. She didn't hear the president's speech, but said she was impressed by Obama's efforts on immigration reform. Miss America Mallory Hagan says she made it to the inauguration despite the chilly weather. In an interview Saturday, Hagan had said she wasn't sure if she would attend President Barack Obama's public swearing-in ceremony Monday even though she had a ticket because "it's going to be freezing." But on Monday she tweeted a photo of herself from the inauguration wrapped in a blue scarf with the words "bundled up!" She later tweeted that she was "proud to be an American." Hagan, a 23-year-old Alabama native who lives in New York, won the Miss America title earlier this month. Minutes after his inauguration speech Monday, President Barack Obama signed documents officially submitting top administration nominations to the Senate. Obama also signed a proclamation to commemorate the inauguration. The proclamation is entitled "National Day of Hope and Resolve, 2013." 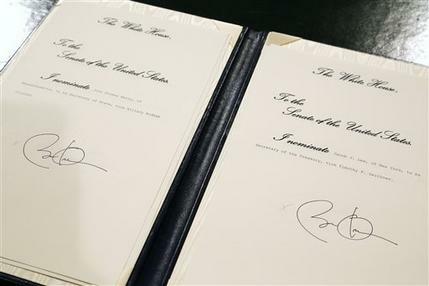 "I'm proclaiming peace on Earth and goodwill towards men," Obama quipped as he signed the document. Today's event: Real, pseudo or something else? 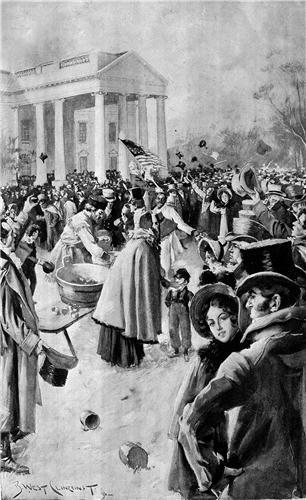 Ted Anthony, AP's editor-at-large and frequent writer about American culture, looks at the meaning of today's inauguration. A half-century ago, Daniel J. Boorstin, one of the country's most famous historians, coined the term "pseudo-event" — an event that happens for the sole purpose of being watched. 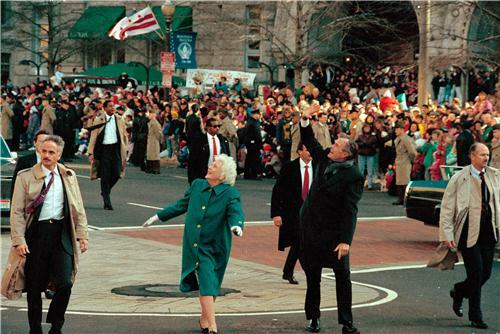 "The celebration is held, photographs are taken, the occasion is widely reported," he wrote. 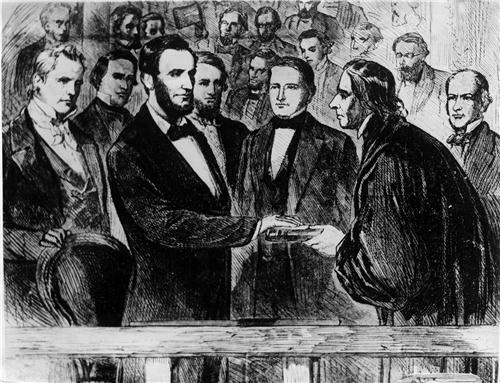 That was today's presidential inauguration — right down to the letter. So much of politics is a scripted affair already. Much of what is done by politicians and those who govern is designed to be "on message," to "play to the base" or "stick to the talking points." 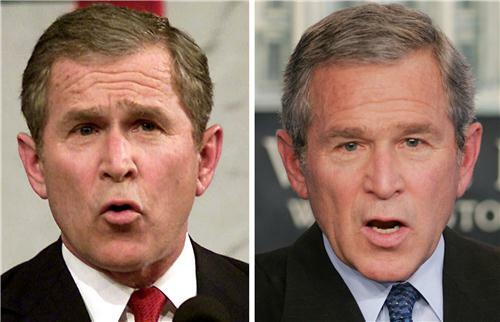 Speeches are written by five, 10, 20 people and then emerge from the mouth of one. It's hard to determine precisely what is accomplished and what is, for lack of a better term, "accomplished." Even in the realm of scripted affairs, though, this was noteworthy: It was the scripted version of a scripted version. A pseudo-pseudo-event. The actual inauguration took place Sunday in the relative privacy of the White House because the actual Inauguration Day fell on a Sunday. 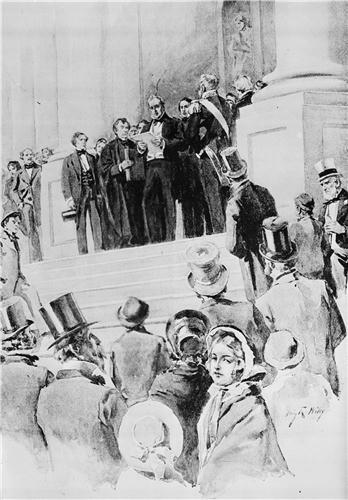 Today's public version contained thousands of people, lots of dressed-up dignitaries on stage, Supreme Court justices — and an oath of office that, from a legal standpoint, meant nothing. 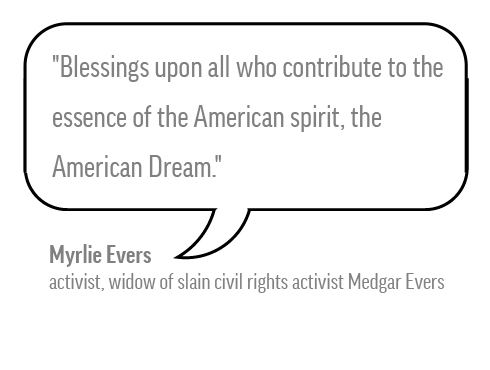 When it comes to the American identity, of course, we need and savor these events. They invoke national themes and foster pride. 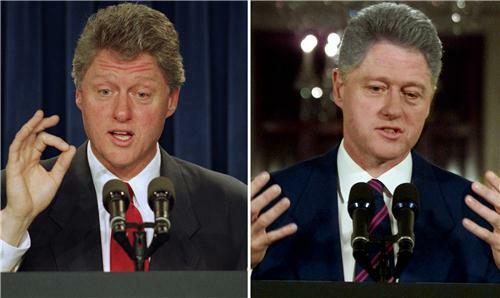 They tell us: Continuity exists, the nation goes on. They give the president an opportunity to deliver a real message amid all the careful calibration. But as Americans consider this day, it's worth considering how very American, too, is the scripted event that took place in front of their capitol and on their television, video and smartphone screens. And you might ask: In the end, which one was the real event? 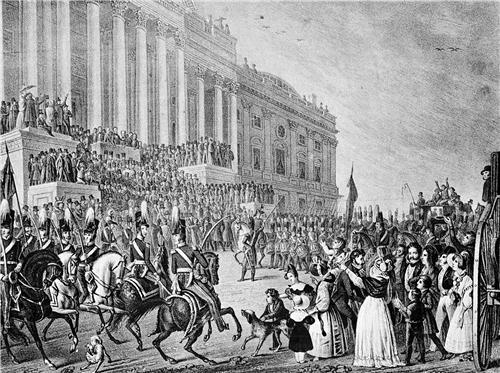 The inaugural parade is under way, with strains of American composer John Philip Sousa and `Yankee Doodle'. 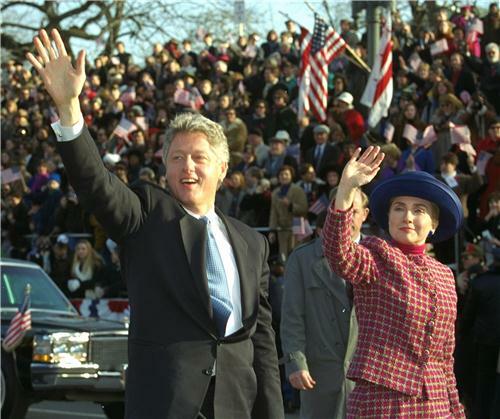 The motorcade is proceeding down Washington's wide boulevards as spectators line the streets and cheer. 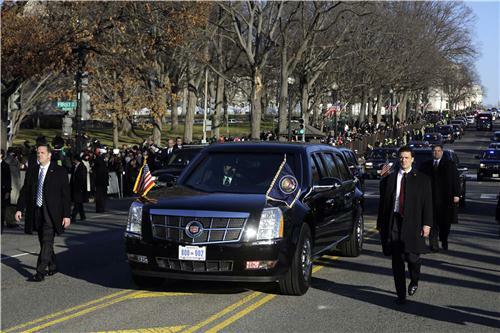 Many are straining to see inside the presidential limousine for a glimpse of the president and first lady. 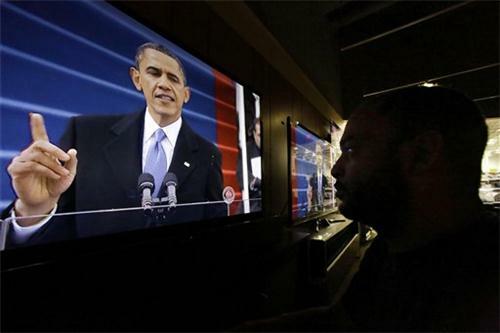 Many TV networks pause for inauguration, MTV opts for "Catfish"
ABC, CBS, NBC and the cable news networks cast aside regular programming Monday to carry the ceremonial swearing-in and Obama's inaugural address. 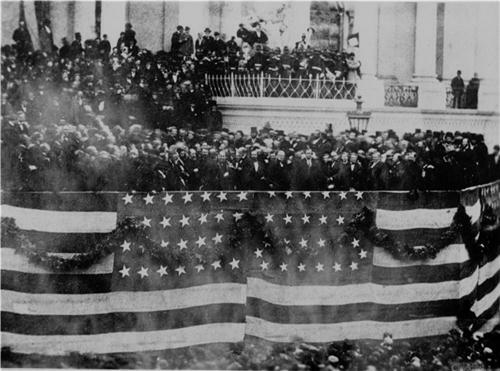 It didn't carry the same attention Obama's first inaugural did. 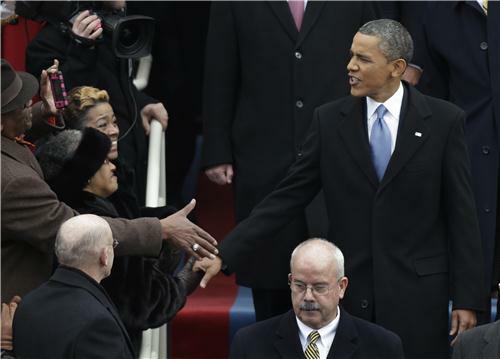 In 2009, even ESPN and MTV covered the swearing-in. This year, ESPN stuck to talk about the upcoming Super Bowl and MTV aired "Catfish: The TV Show." 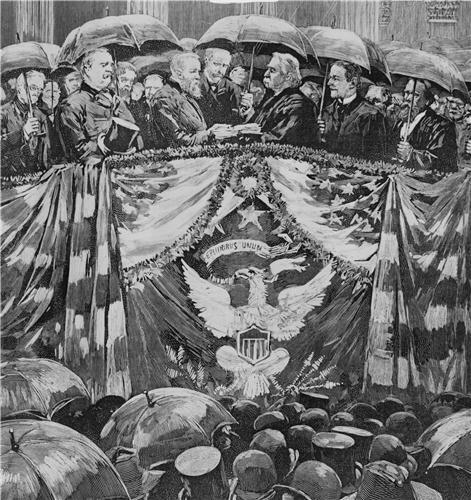 Obama's inaugural address lasted about 18 minutes, only slightly longer than the inaugural poem, but shorter than the evaluations of on-air pundits. 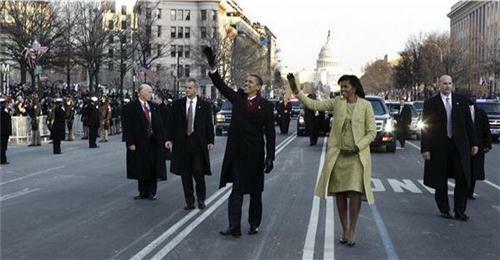 The Barack Obama "brand" was on full display along the parade route as fans waited for the president to travel from Capitol Hill to the White House. Many wore Obama T-shirts, ski caps, hoodies and buttons. 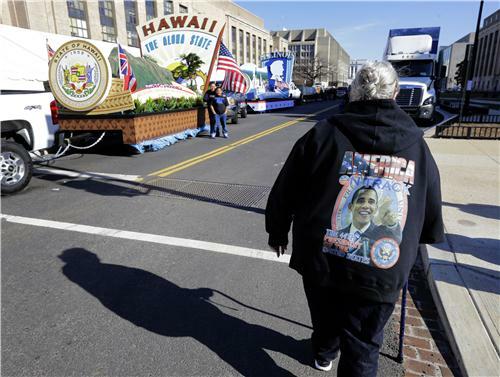 One woman wrapped herself in an Obama beach towel for extra warmth. A popular item was the canvas tote bag with pictures of the Obama family on the front and back. Some waved small flags with Obama's likeness on them. _ Sam Hananel and Darlene Superville, AP reporters in Washington, D.C.